Calculating circle's coordinates using radius and rotation? 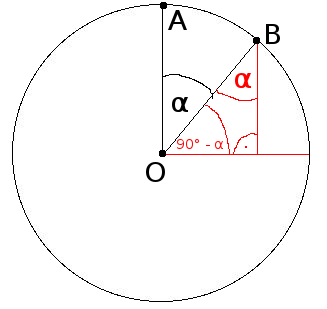 If I know radius of the circle, O's coords and alpha, can I calculate B's coords? I have painted as red that, what, I think, might be helpful. I would also like to ask... is it possible to calculate alpha from B's (and O's) coordinates and ? Yes, you would have to use the inverse sine and cosine functions along with some attention to which quadrant the relative position of B to O places the angle . Can You write whole formula? It would really be an algorithm rather than a formula. You would have to use conditional statements based on B's relation to O to determine the quadrant of . You know the radius of the circle. That means you can write an equation for that circle. You know the angle of line OB. That means you know the slope, by tangent. If know know the slope of a line and that it intersects the center of the circle, you can write an equation for the line. Solve for x and y as the interception of the circle and the line.